For full, journalistic disclosure – I work part time at a small, third party electronics repair shop that fixes a lot of Apple products. I wanted to provide assurances that I’m not going after Apple here because it’s going to benefit me in any way. It won’t. I just think that when you buy a phone for $600 – $700 (which is the price of any new iPhone before your carrier’s contract subsidies), you should have an expectation that it will last more than a year or two. Over the past year, I’ve seen the same problems with smart phones again and again. Simple, easily repairable problems, like broken glass or a broken power button cause people to throw what are essentially fully working pocket computers into landfills. Some of this has to with the ease of getting new phones (upgrades) by re-signing contracts with your carrier, but mostly it has to do with Apple’s policy on repairs, which, for the most part, is limited to them selling you an entirely new device. 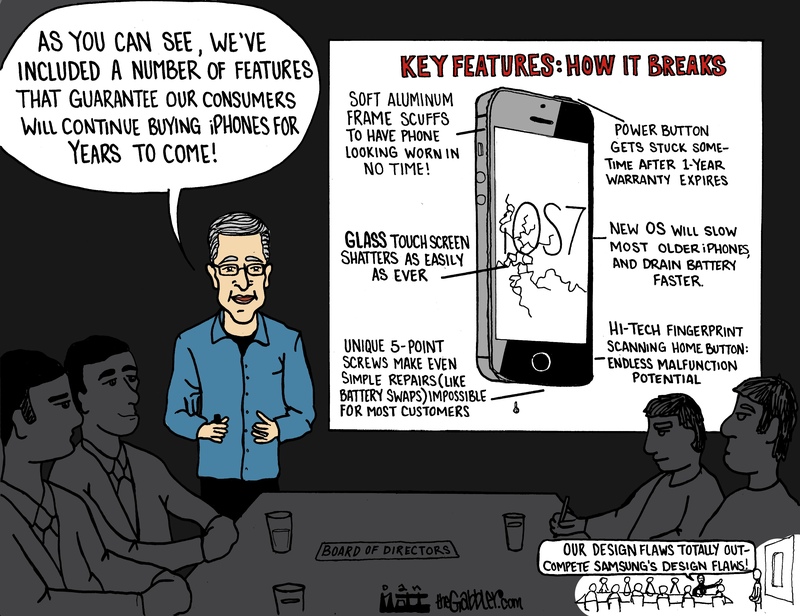 Planned obsolescence and overlooking subtle design flaws is not a strategy that’s unique to Apple, but I think they do it better and with less criticism than their rivals. And it’s not just on them – most people seem excited to drop hundreds of dollars for a next-gen device that is more fragile than their current one, and, technically speaking, not any more useful. So next time you have an issue with your phone, I would look into getting it repaired instead of giving in to the smartphone failure-feature trap. ← What Went Wrong With Healthcare.gov?